Another mass school shooting today, in a Southern Oregon college. In a gun-free zone. The charts for mass-murder events virtually always carry a complex configuration I call the Bloodbath Formula. Today's configuration also connects to Russia's commencement of bombing of ISIS-related targets in Syria, the latest development in an ongoing feud between liberal "change-bringer" Barack Obama and the tactically shrewd conservative Vladimir Putin. 1. Pallas ruler Jupiter trine Pluto. 2. 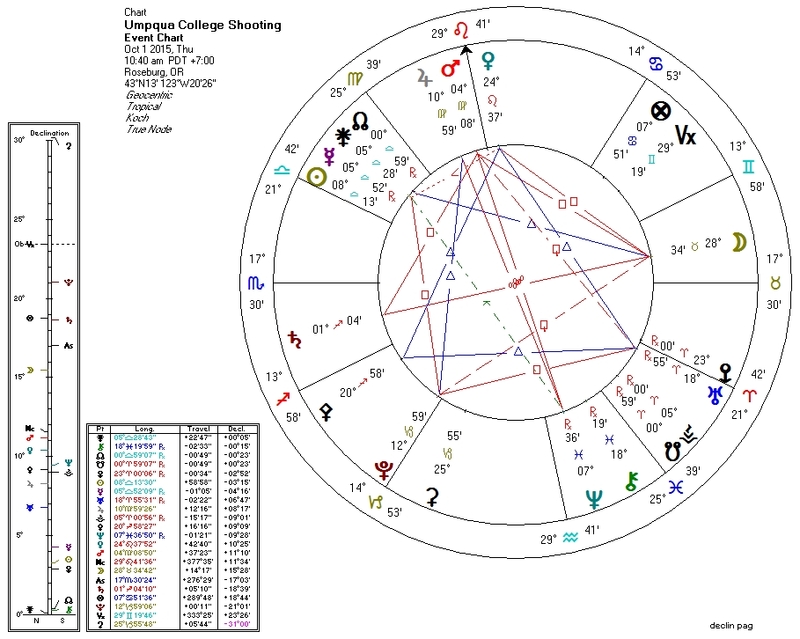 Second House ruler Jupiter opposite Neptune; Venus ruler Sun quincunx Neptune. 3. Pluto in the Second House, square Sun (ruler of Venus).